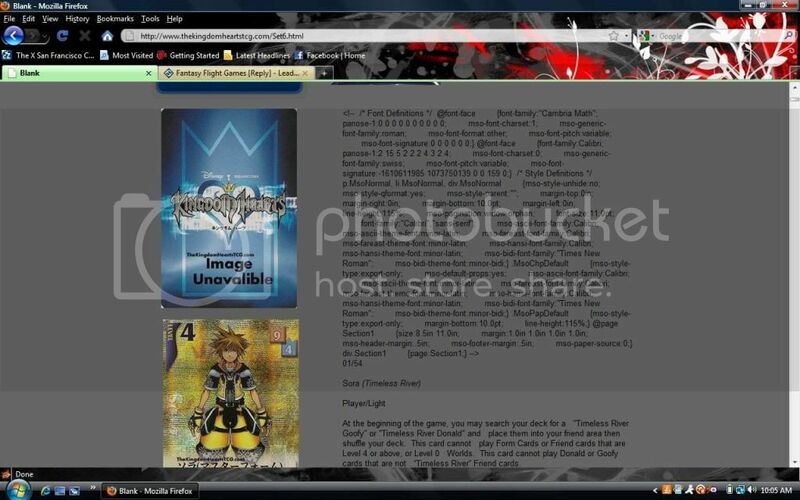 The new unofficial Kingdom Hearts TCG website! We got Japanese scans! Check it out NOW! For those who don't know a great undertaking in TCG history has occured. A group of dedicated fans have worked long and hard to bring you, for the first time ever, a COMPLETE card image database which INCLUDES JAPANESE UNRELEASED IN NORTH AMERICA cards complete with accurate translations. To top off this package the members of the colaboration have also put together a new fansite for the KH TCG seperate from the FFG forums. I encourage anyone interested to visit the above link. Database could be completed as soon as Monday! That's odd.. querry: What browser are you usin? 'N perhaps there's a scroll bar at the bottom? It shows up perfectly fine for myself 'n many others. Just checked the site and everything is fine...as Choitz suggested maybe it's the browser you're using? You two do know he posted that 5 minutes before the last 14 translations were put up, right? Timestamps. Always look at the timestamps.